A new drill down to invoice has been added to COP/Inquiry/Invoice Inquiry by Customer. Highlight the inquiry line and press Enter to drill down to Invoice detail. How Do You Purge Quote Type Orders? Can We Turn Off the Ability for Users to Enter Orders for a Customer on Credit Hold? How Do I Remind Salesmen to Send Order Acknowledgment? Is There a Way to Export and Import Price Code Files? Can a Credit for Kits on an Order Return Components to Inventory? What Triggers the Billing Edit List to Display an O/S Instead of Quantity in the Back Order Field? 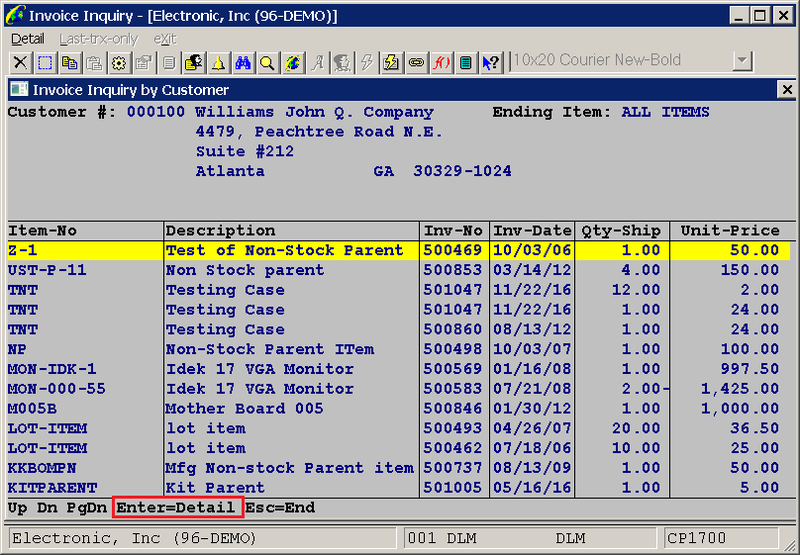 Can Item Lead Time Be Added to the Sales Desk Screen? Why Would Invoice Balance Due Field Be a Credit? Can the 'Design Your Own Picking Ticket' Feature Print in Pick Sequence? What Do I Do With "Invoice Printed But Not OK" Orders? Can Elliott Support Gift Cards or Gift Certificates? Received Message "Must Run COP Setup First"
What Are CP3HSxxx.BTR Files? Can We Delete Them? Why Does the Sales Order Date Not Match the Entered Date? What's The Bar Code Symbology Used on Pick Ticket Heading Area? What Do the Statuses Mean on the Order Inquiry Screen? What Other Programs Can Update Order Date Picked Field? In Order Line Item Screen, Got Message "Qty Available Had Changed While You Enter This Line Item"
Feature - Added Global Setup Field "Print Total Weight On Packing Slip?" Can I Get Alert When Sales Order Ship Date Is Changed? How Is Number of Boxes (Cartons) in an Order Calculated in Elliott?